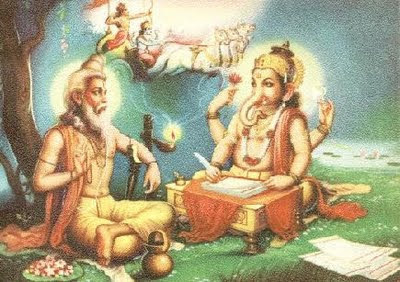 Vyassa dictating the Mahabarata to Ganesh. Today is the Indian festival of Guru Purnima, a celebration of gratitude to teachers, both academic and spiritual. In sanskrit, gu means darkness or ignorance and ru means the remover of that darkness. Purnima means full moon and this day is observed on the full moon of the Hindu month of Asadh. It is celebrated throughout the dharmic world. On this day people pay respect to their teachers, living and dead. It is also the birthday of Vyassa, a great Hindu sage, who gathered the vedic texts and created the Mahabarata. It is said that on this day, Buddha gave his first sermon at Sarnath after becoming enlightened. Hindu legend says that Shiva became a guru on this date. My father who taught me the joy of humor and the liberating experience of art making, as well as showering me with unconditional love. My mother who has demonstrated that there is always the possibility for redemption. Mr. Foster, my middle school English teacher, who encouraged me to take risks and think creatively, and inspired and fortified my still raw and unrecognized (by me) gifts. For all who mentor and nurture and teach, for all who do this with a generosity of spirit and an open heart, on this Guru Purnima, I give sincere and bountiful gratitude. This entry was posted in sacred, Teaching and tagged Buddha, gratitude, Guru Purnima, Mahabarata, Sarnath, Shiva, teachers, Vyassa. Bookmark the permalink. Fun to read. I forwarded to Alaksh. The bed has stayed put.